I thought while everyone is in the Fourth of July holiday mode it is a good time to write about a patriotic wallpaper, or rather a border. Since I’ve already written in years past about the firecracker wallpaper created for the American Bicentennial, and a scene from Views of the American War of Independence showing patriots fighting for freedom, a little database searching turned up this patriotic beauty called Americana. 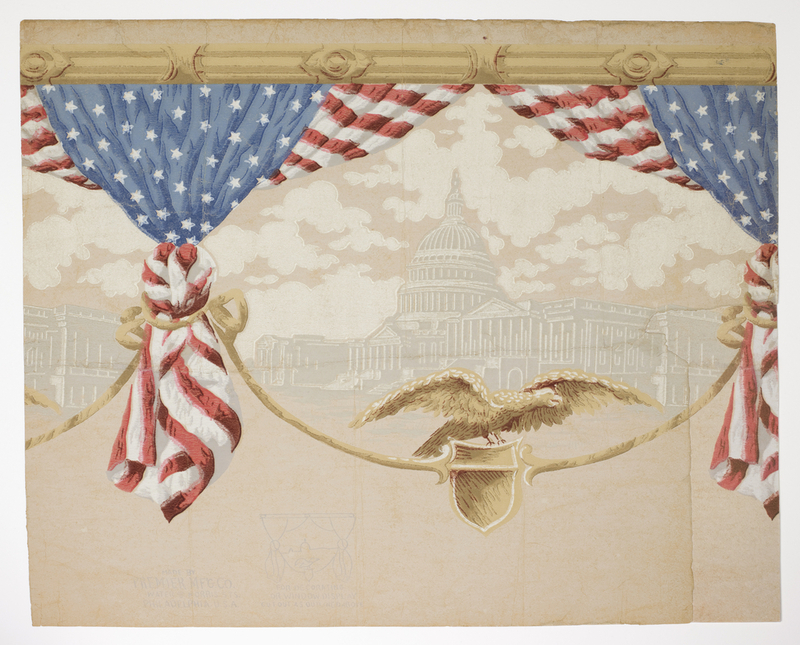 Produced right around the turn of the twentieth century, the design sports stars and stripes-patterned bunting printed in bold red, white, and blue, with a view of the newly renovated Federal Capital building printed in more subtle shades of gray. And let’s not forget our national bird, the bald eagle, perched on a shield supported by a swagged cord. The unprinted part at the bottom of the paper was intended to be cut out allowing the scalloped bottom edge to overlap the top of a wallpaper pattern, as instructed on the face of the paper. More stars and stripes anyone? Actually, it would probably have been used with a tone on tone pattern, striped or otherwise, or an ingrain paper, which had the appearance of felt and was all the rage at this time. As the text printed on the front instructs, this frieze was intended for decorating as well as window displays so it did have some marketing potential. I am not familiar with the manufacturer, the Premier Manufacturing Company, but am guessing they made products for promotional items and special events, and not just home decor. But this frieze goes beyond the typical point of display item and could beautifully transition to home décor item. It is an attractive design and definitely displays the good old American spirit. Hope everyone enjoyed their Fourth of July holiday.